You are one of the 100,000 people who have par­ti­cip­ated in Iron­man events across the world just this year, but what next? Increas­ingly we are see­ing long dis­tance triath­letes look­ing for new endur­ance based tests after cross­ing the fin­ish line at an Iron­man, but to what extent does the skill set trans­late to the sport of multi-day ultra run­ning? 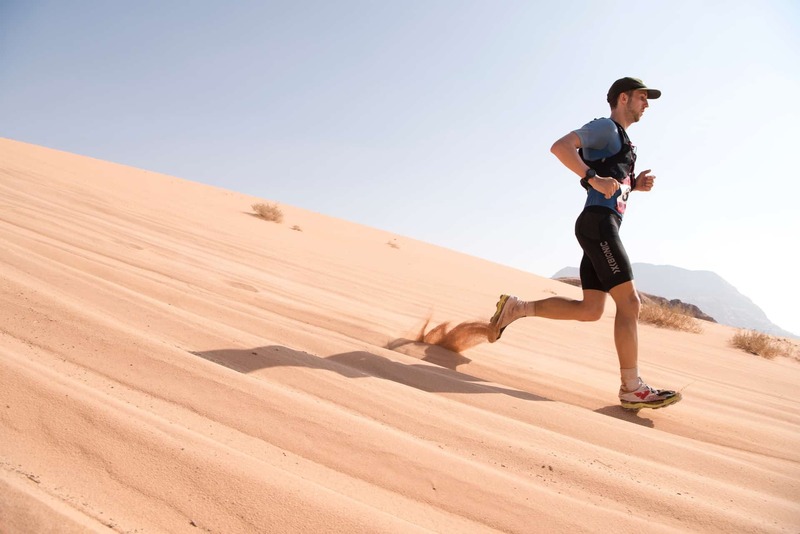 We caught up with Jan Pas­cal Tschudy who fin­ished in fourth pos­i­tion at Wadi Rum Ultra 2018 (Ultra X Jordan) to find out how he did it. You are an exper­i­enced and suc­cess­ful triath­lete, so what made you make the switch to take on the chal­lenge of an ultra-mara­thon? Thanks, over the last two years I have done a lot of half and full dis­tance triath­lons. I have always been keen in attempt­ing some­thing as adven­tur­ous as an ultra-mara­thon since I star­ted run­ning in 2009/2010. Three years ago I nev­er felt ready to go for one. Not men­tally nor phys­ic­ally. How­ever, after start­ing triath­lons and com­pet­ing in longer dis­tance events I became more aware of what my body was cap­able of and felt more and more that now was the right time. After three Iron­mans you know that your body can stay in an aer­obic state for 9–10 hours. The ques­tion then was wheth­er I could men­tally endure an ultra, and when would be the right time to do one. After hav­ing met someone who had pre­vi­ously done the Wadi Rum Ultra in 2018 I was per­suaded! Luck­ily I got a start place and in Jordan I had one of the most awe­some hol­i­days that I have ever had. You decided to dive straight in with a 5 day, multi-stage, 250 km race in the desert before single stage or short­er multi day race. Why this approach rather than start­ing with some­thing short­er and work­ing your way up? Train­ing blocks of 2 to 4 hours a day or more on the week­end for Iron­man gave me con­fid­ence that my body can handle high levels of phys­ic­al exer­tion. So the ques­tion was for me if my body could handle so much run­ning. Did you find the trans­ition from triath­lon dif­fi­cult and if so why (or why not)? For me the trans­ition was not too hard. I kept up with everything but added slowly more run­ning. My approach of “TUF” (Train­ing under Fatigue) applies really well to ultras. I did not go for big week volumes, those would have prob­ably only lead to injures. My biggest run­ning week was only 75 kilo­metres, and instead I aimed for con­sist­ency (con­tinu­ally hit­ting 50–60 km per week). Bik­ing and swim­ming kept my fit­ness at the good level which I had already brought with my from the Iron­man train­ing. How did your train­ing change in pre­par­ing for the Wadi Rum Ultra versus train­ing for an Iron­man? I only added some more run­ning, everything else (bike and swim) stayed the same. Even the ses­sions stayed the same. I didn’t com­plic­ate things by incor­por­at­ing com­pletely new workouts. The biggest change was incor­por­at­ing some trail run­ning and hik­ing week­ends. I spent some qual­ity time with friends out­side run­ning up and down the alps. Can you describe a typ­ic­al train­ing week? Dur­ing my Ultra X train­ing I aim for 5–10k swim­ming, around 2 hours on the bike and between 5–7 hours on the run. I get my volume for the run­ning by split­ting the ses­sions into two or even three runs over one day. This helps get­ting volume done on a “nor­mal” work­day. It also helps you pre­vent­ing injur­ies and you can have a inter­val on the first one and the second run just as an really easy one to get the volume in. I am now in winter and hav­ing Trans­gran­ca­naria com­ing up I have been spend­ing a lot of time on my feet over the week­ends! How did you fuel and hydrate in the desert, and how did your strategy change from that used in longer triath­lon races? I con­sumed the same food as I do in an Iron­man. This means for me (melted…) chocol­ate bars! The most import­ant thing is to have a “plan”, know what works for you and stick to it! My plan was that I drink about 1.5–2 litres an hour. 0.5 litres of this being iso­ton­ic and the rest water. Every hour I would eat one energy bar and every 35–45 minutes take a salt cap, so I was hit­ting around roughly 350–400 kcal per hour. On the second day I for­got my Iso tabs and could get in any water. This was the worst day for me and I learned how import­ant it is. Because of the tem­per­at­ure I made I was sip­ping every 5 to 10 minutes. You fared incred­ibly well, fin­ish­ing in fourth pos­i­tion just off the podi­um and appear­ing to get stronger as the week went on. Do you think your triath­lon exper­i­ence helped you through the race? The slow start and the take aways from each day led to bet­ter and bet­ter per­form­ances. It def­in­itely helped, espe­cially the fact that we start off easy to feel strong for the last half then you can go. Also hav­ing the nutri­tion plan for racing helped to keep up my stores all day long. You have signed down for Ultra X Sri Lanka in April? What are you chan­ging (if any­thing) about your approach to that race? My shoe choice wasn’t the best. I wore the ON Cloud­surfer (my all time favour­ites). I knew I could run in them forever and not have to worry about hav­ing blisters, but they were too soft and did not provide a sol­id sur­face for the sand. This I will change. Also next event I want to try poles! I think these help quite a lot when going uphill. Obvi­ously first I need to try and see how they work for me. I am not going to change any of my nutri­tion. What advice would you give to someone approach­ing an Ultra X event for the first time? It’s hard, but it is not impossible. Hav­ing a sol­id train­ing back­ground and a nutri­tion plan is a good start, and then it’s all about your mind. It is not the dis­tance that kills you it’s the tempo. Start off slowly at your own pace and don’t be dic­tated by oth­ers. Just run for you and listen to your body. Train­ing can be split into mul­tiple runs in one single day but make sure to avoid your gray zone. Do the hard things hard and the easy things EASY. Read what’s on the com­puls­ory kit list, know what you have to organ­ize and what you need to run with. Try to run with your gear at home, not to bring it to the event and then try it. This is also a good advice to the food you’re going to eat for one week. Try it at home first.